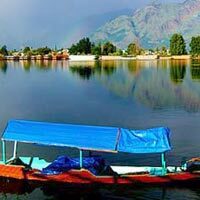 Check in hotel in Srinagar half day sightseeing. Evening free for Liesure activities. Over Night at Hotel/Houseboat. After Breakfast. Full day tour of world famous Mughal Gardens visiting the Nishat Bagh and Shalimar Bagh. A Lake Trip, Charchinar, Floating Gardens & interesting canals by a Luxurious Shikara. Overnight att Houseboat. Full Day excursion to Pahalgam (2440 Mts). On the way visit Saffron Fields, visit Chandanwari and other local sightseeing of Pahalgham Overnight stay at Pahagham. Full day excursion trip to Sonmarg which is the most beautiful drive from Srinagar. Sonmarg (2690 mts) known as the gateway to Ladakh. One can ride on horse to Thajiwas glacier where you can have snow sledge rides round the year. Evening return back to Srinagar. Overnight at houseboat. Full day tour of Gulmarg which is one of the most beautiful summer resorts in the valley. Enjoy the splendor of nature and snowy mountain. One can have Gondola Ride (Cable Car) from Gulmarg To Khilanmarg. In the evening return To Srinagar or stay at Gulmarg Overnight at Hotel. Leave early Morning from Gulmarg to Srinagar or drive to Jammu Railway Station for onward journey.